Thorny devils look like they lost a fight with a thorny bush. They’re covered from head to tail with spines and thorns. These thorns make them look scary, but thorny devils are actually shy and quiet. The thorns probably help protect these lizards from predators like birds and snakes. All About Thorny Devils: They look like they lost a fight with a thorny bush. They’re covered from head to tail with spines and thorns. 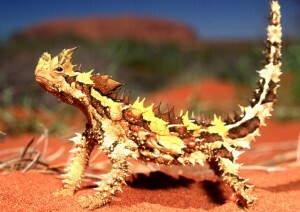 Thorny devils live in the deserts of Australia. Very few animals live here because it’s so hot and dry. Thorny devils have some tricks for dealing with the heat. When it’s hot, they sometimes burrow under the ground. They also rise up on their back legs and lean against a shrub for balance. Thorny devils change color depending on the temperature. When temperatures are cool, they’re usually brown or gray. Thorny devils lap up ants with their tongues. They don’t notice the stings, but can eat up to 3,000 ants in one day! Thorny devils change color depending on the temperature. When temperatures are cool, they’re usually brown or gray. As the temperature rises, they become pale orange or yellow. Thorny devils don’t hibernate completely, but they stay in burrows most of the time during very hot weather. When a thorny devil is scared, it tucks its head under its front feet. It has a bump on the back of its head that looks like another head to a predator. This bumpy head is hard to beat, so predators quickly give up. 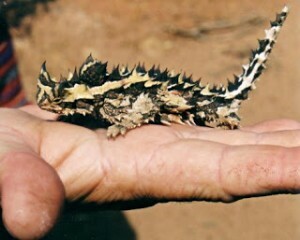 All About Thorny Devils: A small thorny devil. A video documentary all about thorny devils. Question: Do thorny devils lay eggs? Answer: Thorny devils build underground nests for their eggs. When the eggs hatch, the babies can take care of themselves. Question: How does the thorny devil get water? Answer: The thorny devil collects water from dew or the ground. The water moves up the reptile’s body to its mouth! 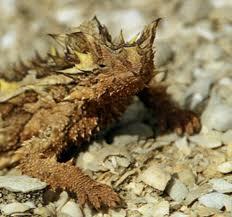 Enjoyed the Easy Science for Kids Website all about Thorny Devils info? Take the FREE & fun all about Thorny Devils quiz and download FREE Thorny Devils worksheet for kids. For lengthy info click here. Declan, Tobin. " Fun Facts About Thorny Devils ." Easy Science for Kids, Apr 2019. Web. 23 Apr 2019. < https://easyscienceforkids.com/all-about-thorny-devils/ >.